It’s just not possible that we are alone in this universe! 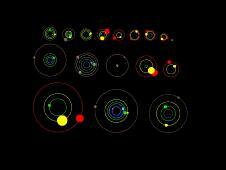 Only yesterday the NASA Kepler space telescope found 26 planets outside of our own solar system! Known as exo-planets or extra solar system planets these planets are found in 11 “new” solar systems with each solar system consisting of a star that the planets orbit around just like our own solar system. Kepler has only been looking seriously for two years, and then only at a small patch of sky but has so far found a total of 60 planets so lets dream about what it might find in the next ten years or so! So if life does exist outside of this planet what could it look like? Well it probably would not resemble life as we know it. Because each species adapts to its own environment we could imagine all manner of lifeforms from bacteria and plants to massive dinosaur like creatures. Even if extra-terrestrial life resembles human beings they might not have skin, eyes or the senses that we use every day, indeed they might well have other senses or limbs that have adapted to their own planet, although more likely are bacteria like structures or plants……but who knows… the big bang threw all sorts of elements into the giant melting pot that we call the universe, and what comes out of that pot we cannot even start to imagine…or can we?